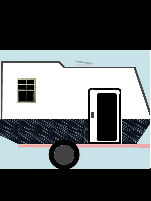 Teardrops n Tiny Travel Trailers • View topic - 4 x 8 Camper Build from scratch. 4 x 8 Camper Build from scratch. Re: 4 x 8 Camper Build from scratch. 4 x 8 Camper Part 36. Spare Tire, Stowage Space, Fire Pit. The initial goal from 15 months ago finally comes together!